What should our new Elf-inspired Holiday Soap be called? You could probably tell by the advertisements and songs on television and the radio. Or by the decorations at your favorite store. Or, if you happen to live in Colorado like we do or in more Northern states, you could probably tell by the layer of snow melting slower than usual. Christmas is upon us! Blissology has been gearing up by restocking everyone's favorite things (like Footsie Bars - no matter how many I make, we always need more!) and cranking out our holiday edition soaps. We already have some Cinnamon Spice Soap made (we stock that one all year now since you all love it so much!) and a lovely new one called Christmas Memories. Both of those will be ready in a couple more weeks. Pam is about to mix up another new holiday soap, but there's a slight problem. We don't know what to name it! She keeps accidentally calling it "Elf Farts" which is hilarious for many reasons, but one of which I should probably explain. See, there's a popular tropical fragrance that is mostly banana called "Monkey Farts." You know, since they eat bananas all the time, only I'm quite sure monkey's don't pass fruit-fragrant gas. 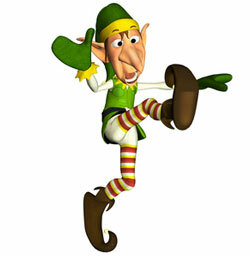 Our supplier calls our new holiday fragrance "Elf Sweat" for the same cute novelty effect. Only Pam merges those two together and gets "Elf Farts." I'm not sure that it's so cute then! Anyway, we need your help naming the new soap! It isn't made yet, so I don't have pictures, but the plan is to make it a white soap swirled with bright happy green and blue. It smells like candy, sweet sugar, peppermint, and effervescent soda pop. The poll and contest closes on November 20th at midnight so get going! 2 Responses to "The Elf Did It"
I like the way your soaps feel so anything magic would be good. I know it will be heavenly smelling. Cinnamon Spice soap -- nothing like that wonderful aroma! A mother-daughter duo in Colorado building a business from home with handmade soap, bath, and massage products.